Description: Frilly Lace™ Lomandra is one of the best flowering Lomandras around with its large, intricate yellow flowers. This is a spring flowering plant, producing masses of perfumed lacy flowers amongst its strappy green foliage. garden beds with evergreen foliage on display throughout the year. 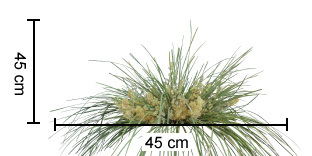 Position: Frilly Lace™ Lomandra is frost and drought tolerant, preferring free draining soils. Tolerates full sun to moderate shade. Care: Water as required for 8-13 weeks until established. Plant in a well mulched garden (chunky mulch is recommended, but can tolerate mulches with fines). Use slow release fertiliser in spring if required. Lomandras like this generally don’t need much care once established. Simply prune every 3-5 years and remove old flower stems as required. Where it works: NSW, ACT, VIC, SA, WA & TAS.